Screen 1: The Repeater window. Controls on the left can be automated or controlled by a MIDI controller. Studio One’s Repeater is no ordinary delay. For a start, it works on note data rather than audio! Note FX are some of the recent useful and enjoyable additions to Studio One. Note FX process note data rather than audio, as do MIDI plug-ins in other DAWs. A layer of sonic flexibility is added when note data is processed before it gets turned into audio, because it is entirely separate from the sounds that are played, making the score independent of the orchestra. Depending on how your virtual instrument is set up, note data processed by Note FX might play entirely different sounds from the original part, with different transpositions, timing, pitches and note durations. 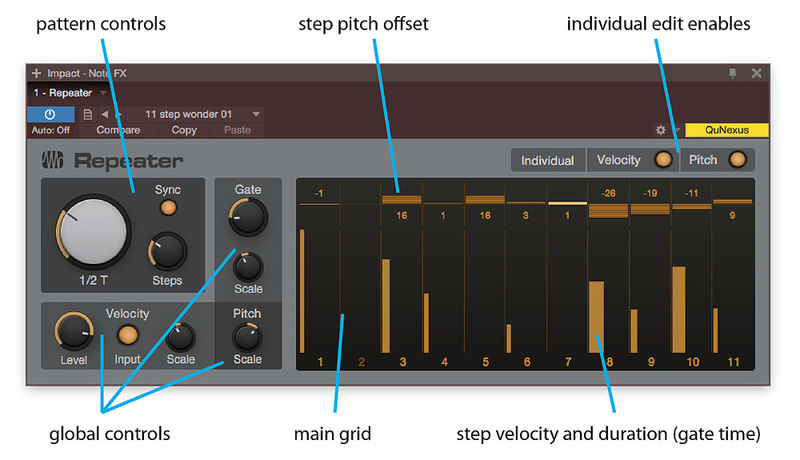 There are four Note FX available in the current Studio One version: Arpeggiator, Chorder, Input Filter and Repeater. Each of these is a sophisticated processor, and this month, I’m going to take a look at Repeater; I will delve into other Note FX in future columns. Repeater is a note delay line with up to 32 note repeats, each of which can have its own duration, pitch offset and velocity control. (Technically, note data in Studio One is not MIDI unless it is coming from or going to an external MIDI device, but, for the purposes of this column, it is conceptually easier to think of note data as being MIDI Notes.) The Repeater can do very interesting processing, but its documentation is pretty thin, which is why I’m going to take you on a little walk through it. The place to start is the pattern control section in the upper-left corner of Screen 1 (above). Here, the big knob sets a Grid value that determines the delay time of each step in the grid, and the Steps knob controls the length of the entire note-repeat pattern. When the Sync button is engaged, delays are musically based, that is, they are expressed as note values based on the current tempo. When Sync is off, delay values are in milliseconds. With delay time, pattern length and sync set, the action moves to the grid on the right, where you’ll see two rows of vertical bars. In the lower row with the larger bars, the height of a bar represents the velocity of the note repeat at that step in the pattern, while the width of the bar is the note duration (labelled ‘gate’). The row at the top of the grid shows the pitch offset for each delay tap. Pitch offset is the number of semitones added to or subtracted from an input note when that pattern step plays, so a pitch of -3 on a pattern step means the note repeat at that step will play a minor third below the input note. The ability to adjust gate times is very powerful because, in contrast with an audio delay line, changing the duration of a note can result in an entirely different timbre, depending on the synth patch being used. Gate times and velocity levels are changed simply by dragging left/right for gate time, up/down for velocity. Dragging any step moves them all unless you engage the Individual Velocity and/or Pitch buttons above the grid, whereupon you can set each step’s gate time and/or velocity individually. This takes more time to tweak, but it’s where the real fun starts. Pitch offsets at the top of the grid can be set over a 13-octave range, from +4 to -9 octaves, and they, too, are simply dragged. My experience is that the more sophisticated and active the musical line going in, the simpler the pitch offsets need to be. Otherwise, even with a small number of steps, things quickly get very dense (which is an interesting sound, but not suited to a wide variety of applications). Velocity will typically control the volume of a note played by a synth... but only if the synth patch has velocity assigned to modulate volume! Surprisingly, not all synth patches default to this, though nearly all synths are capable of mapping velocity to control volume, which must be in place on the synth before Repeater’s velocity grid will be of any use for dynamic control. Screen 2a: With Velocity Input disabled, bars in the main grid start with the full-scale value.While the main grid shows the velocity value for each step, the Velocity section in the lower left provides global controls that determine how the values in the main grid are processed to produce the output velocity values. It’s a little tricky to get your head around, so hang on. Screen 2b: With Velocity Input enabled, the value of a bar scales the input note velocity.Each velocity bar in the main grid is set to a percentage value that scales the input velocity in order to obtain the output velocity for that note. A percentage is useful here because there are two references that can be used as the input velocity. With Velocity Input inactive (the button is dark grey), the reference is full scale, and the velocity of the input note is ignored. So if a bar is set to 50 percent, the velocity generated for the note will be, in fact, 50 percent of full scale (in MIDI, this would be halfway between 0 and 127, ie. 64), regardless of the velocity of the input note. However, when Velocity Input is engaged and active (button is orange), the reference used is the velocity of the input notes. So, if the input note has a velocity of 120 and a bar is set for 50 percent, the velocity of the repeat note represented by that bar will be half of 120, or 60. So, to recap, the bars in the main grid scale the input velocity, which can be set to either full scale or the velocity of the input note. The Level control in the Velocity section acts as a velocity master, scaling all of the bars in the main grid equally. OK, you might be thinking, if the bars are scaling factors and the Level control is a global scaler, what the heck does the Scale control do? Well, it might be easiest to think of the Scale control as a Tilt control. Getting technical about it, the Scale control scales values using a linear scaling function with a non-zero slope. This produces a tilt effect, as shown in Screen 3. The Pitch Scale and Gate Scale controls provide the same tilt functions for pitch and duration. The Velocity Scale control is also useful for creating a smooth crescendo or decrescendo. First, disable individual control of velocity so that all steps are the same velocity. Next, set the velocity Level control to the lowest (for a crescendo) or highest (for a decrescendo) value you want. Finally, use the Scale control to shape the velocities. Screen 3: Since individual velocity and pitch are both disengaged, each step would have the same velocity and pitch offset but for the Scale controls. The Velocity Level control has been set to the lowest desired velocity, and the Scale control is set to create a crescendo. Meanwhile, Pitch Scale has been set to make each step a lower pitch. Note that low Scale values are used: for instance, velocity Scale is at 112 percent. You really need to play with the Repeater to feel the implications of it processing note data rather than audio, but one thing that will bring that difference home to you is when you stop playback. With an audio delay, you continue to hear the delay after playback stops, but since the Repeater is generating new notes rather than echoing audio, as soon as you stop Studio One, everything stops. Actually, I got some great rhythmic results putting the Repeater on an instrument track and the Beat Delay on the instrument’s audio channel. Whoa, that was some big fun there. Set the number of steps in the pattern to a value that is not an integer multiple of the pulse. For example, in good old 4/4, set a pattern of 11 steps. Set the step duration to a value that is not an integer multiple of the pulse. For example, in a straight 4/4 groove, set the step duration to quarter-note triplet. Use Control Link to map a strip from an external controller (I used a KMI QuNeo) to the step duration control. Touching the strip changes the duration, which is fun to play. Screen 4: Musical Delay is the step time in the main grid. Here, I have mapped a KMI QuNeo controller strip to the step time. Typically, I touch the strip to set the step time, rather than sliding my finger along it.The Steps (pattern length) control is also fun to change during playback, but it didn’t respond as smoothly to QuNeo as step time did. Unfortunately, the values in the main grid cannot be controlled through Control Link; only the controls on the left can be externally controlled or automated. Still, using a mouse to change pattern length during playback worked well, as did editing the main grid with a mouse during playback. Repeater takes on whole new purposes when used with drum and percussion presets on instruments, where each note in a preset plays a different sound. Very sophisticated rhythm phrases can be generated from only a few input notes. Groove can be modified by using steps with low velocity to suggest, rather than state, a rhythmic undercurrent. On the whole, I find this sort of transformation, where a lot of information is generated from not a lot of input, to work best when the input is simpler. A lot of great ideas for using Repeater with drum sounds are found in this video from Studio One Expert, starting around nine minutes in: www.youtube.com/watch?v=MU3vRZU_6rY. When you get a pattern you really like, you can capture it either by saving it as a Repeater preset, or by transforming the track to audio. The former method has the advantage of maintaining flexibility, while the latter avoids any problems getting the exact same sound again later. While Studio One does not boast deep firepower in note processing, the Note FX processors offer depth and flexibility, and respond well in live performance. Repeater is a perfect case in point: an apparently simple concept pumped up to a level that can create a sonic world out of a few notes.